NOS original collectible promotional plastic. Also known as "speaker knockout" or "coaster". Measures 3-1/2 inches diameter. 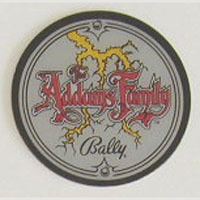 Great for decoration, promotional parts collections, or popular for use as a drink coaster when playing your favorite game!